The Center also confirmed that more people are waiting to sign up for their benefits until after their full retirement age under the program, which is 66 for most baby boomers. Waiting provides at least one-third more in their monthly Social Security checks than the 62-year-old claimers receive. The pace of this promising trend had been masked by the traditional approach for assessing claiming age patterns, which shows 62-year-olds as a percentage of people of all ages who sign up for benefits in a given year. This way of looking at the data provided an accurate picture when each successive age group was roughly similar in size. But the picture became distorted as baby boomers moved through the pipeline and began turning 62 in larger numbers. 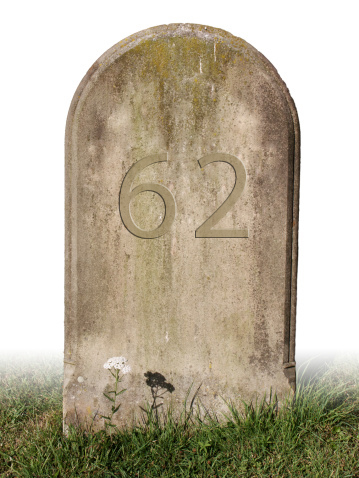 In the new analysis, which is based on unpublished data from the U.S. Social Security Administration, the Center was able to track how many people born in each individual year are claiming once they turn 62, then 63, then 64 – and up to age 70. While recent trends indicate significant progress in delaying claiming, well over one-third of boomers are still signing up for Social Security at 62. What remains unclear is whether those who choose to do so can afford to lock in the much smaller monthly benefit that comes with claiming early. I don’t understand why SSA does not have a table in the Annual Statistical Supplement which shows the trend using cohort data, as you did. By showing only the % distribution of claimants by their current age they perpetuate the widespread error of the public believing that there has been no change in the dominance of claiming at age 62. An alternative to using cohort data is the calculation of age-specific claimant ratios using only those eligible at the specified age. The eligibility data can be requested from the Office of the Actuary, which I did in order to calculate the ratios. In my Monthly Labor Review (Jan. 2008) paper I showed a steady decline between 1995 and 2005 at ages 62, 63 and 64 of 20-25%. 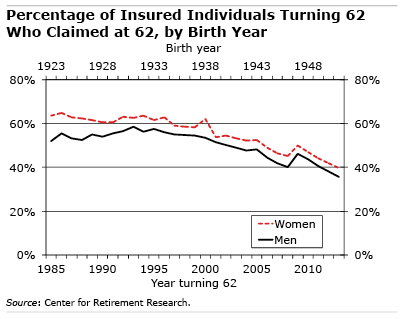 There were increases at ages 65 and 66. Could you tell me how DI recipients were treated in this analysis? Are they in the population base? Also, was there any attempt to isolate the population ensured for OASI benefits? How might the growth of State and Local non-covered employment affected these ratios? Why hasn’t anyone given a generalized breakdown to indicate the difference (% wise) for each year you wait and how many years it would take to catch up in the money you deferred to. I frequently read these articles, which seem to conclude that waiting until full retirement age to collect benefits is the best option. However, there never seems to be any attention given to the underlying assumptions that the SS administration uses – that the total amount of dollars distributed to any individual is about the same, whether it’s more or less per month, over their anticipated life expectancy. First to answer Rick’s question: the increase in the monthly benefit is about 8 percent for each year you wait. Second, a note to all readers: what’s relevant here isn’t a ‘breakeven’ or other actuarial issues but how much money one will have every month when one retires. Of course, this might not matter for someone with lots of money saved, but that’s the issue for regular folks. Paul – Below are the answers to your questions, provided by researcher Angie Chen. 1. DI recipients were excluded from the analysis. 2. The analysis we did was only on the OASI population. 3. The growth of state and local workers would not affect these ratios, because S&L workers were never eligible in the first place.